Don’t you just love the rain? I do! If I could be paid to wear nice warm jackets and boots, sit outside and sip tea, with an assortment of pastries- reading and/or writing I would be rich! 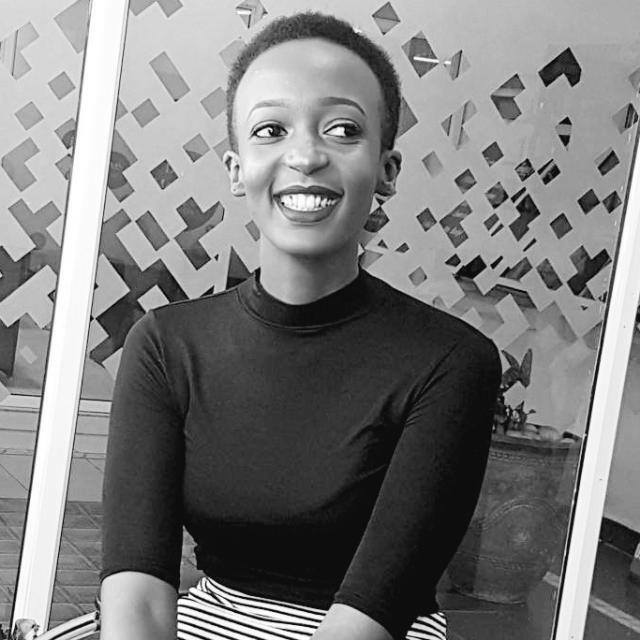 In real life, I brave the rain on boda bodas, arrive looking like a scruffy kitten and try to make up for it with liveliness. Close? This morning I was up slightly after 5 a.m and like most days, I silently grumbled. Why can’t I just sleep?! I ‘pretended’ to sleep some more, but quickly quit the charades, as I usually do. It was raining so I focused on that. Before long, I realised it was nearing the jogging hour and this rain wasn’t about to halt. I called my partner to discuss this bump in our plan(s) She decided to exercise at home while I chose to try out a new course. When I got out, the drops weren’t as fierce as I had expected. The first person I met was a little girl, couldn’t have been over 10. She extended a cheery ‘Good morning’ and right there and then, I knew I was doing this. I ran my first ‘marathon’ around 2009. The marathon is in quotes because an actual one is 42.195 km long and I took part in the 10km race. Nope, not even half! That year, I listened to the ad once and encouraged my roommates to join me. We weren’t fit but there was still time. 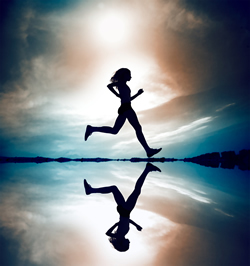 We jogged a bit in the subsequent days but were not serious with the training process. It soon came to an abrupt end. Everyone I told I was participating made a joke about how I would collapse or asked me what I was smoking. This only made me more determined. At the end of the race, in which I surprisingly did more running than walking, an aunt of mine started a mission to fatten us. Her office’s tent had plenty of bites and for University students who relied mostly on ‘rolex,’ this was heaven. So, uhm, I didn’t collapse. I don’t know if MTN was doing this for everyone but my aunt later send me a printed copy of a photograph. In it, I was running probably at kilometre 9.5 because my facial expression was one of sincere anguish. Good times. In the years that followed, I took part in some more, halted for a bit and then ran again with the 4040 team at the Rotary cancer run last year. 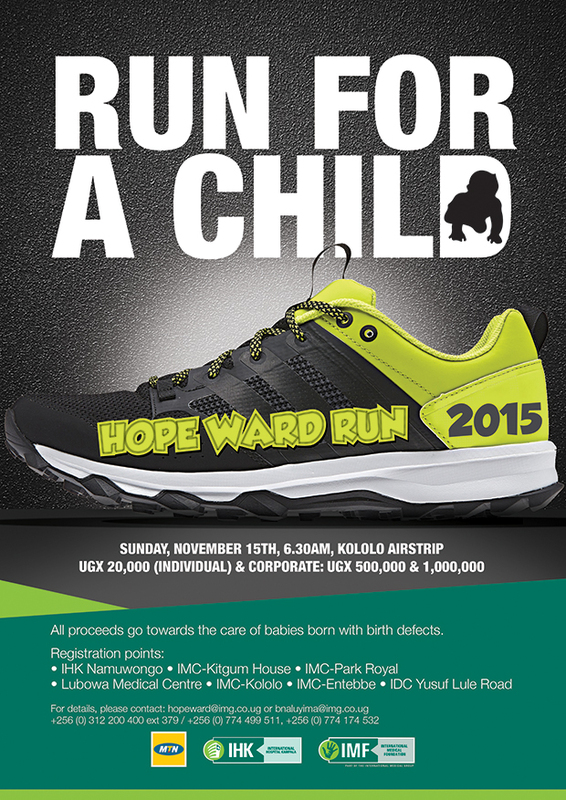 This time round, I am looking forward to participating in the Hope ward run. While I have no problem with multinational companies extending a helping hand, I have first-hand experience in the struggle of smaller, non-profit initiatives. The Hope ward run is organised by the charity arm of IMG (International Medical Group), International Medical Foundation. Over the years, the Foundation has performed complex surgeries for children, provided cancer treatment and worked on victims of the LRA war in Northern Uganda who required plastic surgery, among others. The proceeds from the run are used to support the less fortunate through their health complications. Depending on the situation, patients can receive up to 100% discount on the procedures. Having worked with the disadvantaged and seen many loved ones struggle with not just health issues but also a mostly appalling health system, I am more than happy to support this cause. 10 year old Bernard, is a beneficiary of the initiative. He was diagnosed with Non-Hodgkin’s lymphoma, a form of blood cancer. Together with the Uganda cancer institute, he started chemotherapy and was discharged on 10th April. He still receives treatment from the Hope ward. This year’s run is dedicated to children born with birth defects. Through the funds raised, the foundation shall partner with the Paediatric association of Uganda to provide surgery and/or treatment. Over 1,200 children and adults have benefited from lifesaving treatment through the Hope ward initiative (I just love the HOPE in that!) since 2006. Through my work, I have seen what Ugx 1,000, 10,000 or 20,000 from several individuals can do – A LOT! To participate in the run you only need Ugx 20,000. You can also register as a corporate team for Ugx 500,000 or 1,000,000. I urge you to save the date November 15th and participate in this marathon. Overtime, I have heard people say, “these days people don’t want to just give, they have to get something out of it.” I do not subscribe to that school of thought. However, you can choose to make this a day out for your family, a group activity for your friends, team building with the colleagues or simply use it as a training/testing ground if you’re a fitness buff. Whatever your reason, please come by. I love the rain. I love chilly weather. I love grey skies… Tehehe, I am a bit of a weirdo. I will beat Sibo to these socks. These running socks belong to me! And now that I have ‘actually’ read the post – I am interested. Yes, bumbling-old-me is interested in joining this cause. Is there a beginners track, I wonder? You are not weird, unless of course, so am I! rain is awesome! Socks are ALL yours. I should be here earlier but Monday happened.